It's Austen's story and I couldn't be happier!!! I've been wanting and waiting for Austen's story since he first graced the pages of the THIRDS series. Austen was that dark mysterious character who shows up when you least expect him and is enigmatic and somewhere along the line you discover that they play a much bigger role in things than it seems and yet somehow they seem to be a bit of an underdog...and you want them to get some of the happiness. Austen's been keeping an eye on THIRDS Defense agent Osmond Zachary ('Zach') and his family for a while now. He doesn't feel like he deserves to be happy but that's not how he feels about Zach. In Austen's opinion Zach is everything he wants but doesn't deserve but if nothing else he can keep Zach safe and if that allows him to be near the man well who is he to complain. Zach doesn't share Austen's feelings. He's sure that he could make Austen happy and they could be good together if only Austen would give them a chance. As the youngest in large....I mean large as in 10 children, Therian bear shifters, so we're talking large in more ways than one, Zach has never had to question whether or not he's loved because if anything he's more than likely to end up being loved to death by his overly protective family. Austen's totally the opposite. He's an only child and his parents were...well, let's not waste a lot of time on what's really a waste of oxygen and space to begin with. Austen unfortunately wasn't blessed with either decent parents or any siblings to be loving and supportive. As much as Austen's determined to keep his distance from the man he wants more than anything when he gets a call telling him that Zach was hurt when foiling an assassination attempt, Austen doesn't hesitate to go to him determined to make sure that the man who owns his heart is ok. It doesn't take long for it to become obvious that somehow events have put Zach on the assassin's radar and the threat to both Zach and his family is both real and growing. I loved that the action part of this story took a very definite backseat to the relationship development between Zach and Austen. Getting to see Zach as he patiently showed Austen the patience and love that he had for him. Never pushing and always putting his care and concern for Austen out there for him to see and feel. I think one of my favorite parts in this story was when Zach and Austen were playing in the snow in their shifted forms it was so sweet and such a nice fun moment for them as a couple. I loved Zach's family and how they were with both Zach and Austen. This is a family that's filled with love and they have so much to share, that it overflowed to Austen so easily and naturally just seemed inevitable. The closest thing that Austen has to family other than Sloane and Dex is his fellow SSA agent/TIN agent Brayden who happens to be a Snow Leopard...ok, folks I have a soft spot for Snow Leopards so you can assume right from the start that I like Brayden already and yes, oh please yes can we have a story for Brayden because he just sounds adorable!!! And if it involves more Austen and Zach...well, who am I to complain or maybe well get a story about Sloane and Dex and their new handler...oh, I bet that'd be an entertaining adventure. THIRDS is a series that for me is a must have and sure I've enjoyed some stories more than others but still I've happily read them all and I have every intention of continuing this practice. So for all of you THIRDS nerds out there waiting for this one, it's coming soon and I hope it's as worth the wait for you as it was for me. Enjoy! 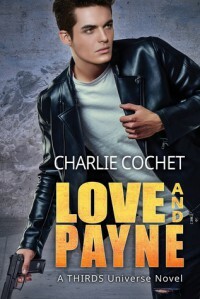 An ARC of 'Love and Payne' was graciously provided by the publisher in exchange for an honest review.